Part of the altocumulus family of clouds, the altocumulus opacus clouds normally form a relatively thick and opaque layer of clouds. At one glance, this can easily be mistaken as the blanket format of cumulus clouds although this is not the case. What height are altocumulus opacus found? The altocumulus opacus clouds are usually bound between 6,500 and 20,000 feet and commonly arise as a consequence of a convection in an unstable layer of the air. The creation of these clouds are very dependent on the height at which they are found and the lower they are, the greater the possibility that they are formed by water droplets, whereas the higher they are, the more likely they are formed by ice crystals. The opacus type of clouds too do not have a specific classification, and again depending on whether it is found at the higher stratosphere, it will be classified as cirrocumulus opacus, at the mid-level as altocumulus opacus and at the lowest layer as stratocumulus opacus clouds. How are altocumulus opacus clouds formed? The altocumulus opacus clouds are normally formed as a consequence of water droplets mixing with the warmer air although if the temperature is cold enough, instead of water droplets, ice crystals for the structure of these clouds. Consequently, this also influences the depth of the altocumulus opacus cloud formation. Depending on how cold it is at the heights of between 6,500 and 20,000 feet, this will determine the depth of the altocumulus opacus cloud range. What do altocumulus opacus clouds look like? The altocumulus opacus clouds can be somewhat opaque although since they tend to form a grey blanket cross the sky, there is sometimes issue with visibility. In addition, if these altocumulus opacus clouds are formed as a consequence of ice crystals, they tend to pose a risk to aircraft because of the ice accretion that can occur on the aircraft as it flies through such a cloud formation. 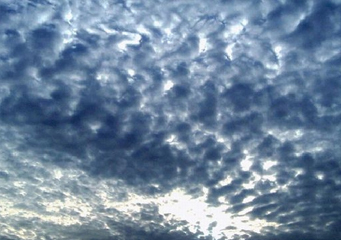 In actuality, altocumulus opacus clouds can be quite deep in the sky sometimes measuring as much as half a mile deep. These clouds form a continuous layer across the sky and tend to block out the sun as well. The next time you are getting a dark sky, it might not suggest that a storm is coming but in reality, it is just an indication that altocumulus opacus clouds are looming overhead! How common are altocumulus opacus clouds? The altocumulus opacus cloud range occurs very frequently and easily visible although there is a risk that it may be mistakenly identified as cumulus clouds because of the blanket format in which it appears. As mentioned before, a good way of identifying the occurrence of the altocumulus opacus clouds is to spot a dark sky where the sunlight doesn’t get a chance to permeate much through the clouds. Where can I see altocumulus opacus clouds? The altocumulus opacus clouds are commonly visible in the United Kingdom and usually suggest that there will be rain coming.